Invasive aquatic plants are a serious threat to Maine’s lakes and ponds. These plants are so vigorous and propagate so fast that they can crowd out native plants, affect fish populations, and make swimming and boating difficult, if not impossible. When that happens, lake users have to fund costly control measures just to swim, fish or boat. Joe drives his boat around a lake in southern Maine that is infested with Eurasian Water Milfoil; some fragments of this highly invasive plant get caught on his prop; later, he pulls his boat out of the lake and puts it on the trailer. A few days later, Joe decides to drive to Mount Desert Island to do some fishing on Long Pond. He launches his boat without checking or removing plant fragments, and while he is driving around, the fragments of milfoil drop off. They float around for a few days, sprouting adventitious roots (long pale hair-like roots that emerge along the stem). Eventually the sprouted fragments, each one a genetic “clone” of the original parent plant, settle to the bottom in a nice sunny spot. A few days later each plant starts showing signs of new growth. By the end of the season the Eurasian milfoil is well established in several locations in the lake. Since 2002, all motorized boats on Maine’s inland waters must display a Lake and River Protection Sticker. This sticker, sometimes called the “milfoil sticker,” reads “Stop Aquatic Hitchhikers – Preserve Maine Waters” and is attached to the watercraft registration. The fees from these stickers go to help Maine prevent the spread of invasive aquatic plants through programs such as the courtesy boat inspections. 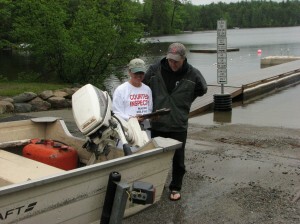 Since 2010, the Somes-Meynell Wildlife Sanctuary has maintained a courtesy boat inspection program during the summer months at the Pond’s End landing of Long Pond. Long Pond is considered one of the best destinations for recreational boating/fishing on Mount Desert Island and Acadia National Park. Fishing and boating are popular summer activities and the public landing at “Ponds End” sees a steady stream of boaters during the summer months. Spending just a few minutes of time on a pleasant summer day at this site will reveal boaters from all over the Northeastern U.S. and beyond (last year we inspected a boat who had just come from Lake Champlain the previous day). The potential for transportation of invasive plants via boats, trailers and other related gear is high, considering the volume of use and diversity of representative states. Staff and volunteers from the Somes-Meynell Wildlife Sanctuary greet boaters as they prepare to launch their watercraft. Inspections take only a couple of minutes and are intended to help boaters get into the habit of inspecting their own boats each and every time they launch. How You Can Help: To find out how you can become involved as a trained volunteer boat inspector, plant monitor, or financial supporter of these programs, please contact the Sanctuary at 244-4027, or e-mail somesmeynell@gmail.com.